Do not let the click of empty magazine prevent the apprehension of a criminal, instead go out with the 523 D.M.S. Twin Double Magazine Pouch from Aker. Engineered to economize rig space while still retaining full tactical operation, the D.M.S. mag holder is ideal for law enforcement professionals as well as recreational shooters. Featuring a stunning premium leather construction, the pouch offers a look that is as impressive as its durability. Custom molded sleeves hug the frame of the magazines for reliable item retention while running, but leave the tops exposed for quick item retrieval from any position. 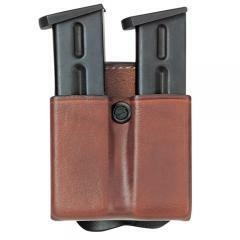 Whether running, sitting or standing the dual holster ensures the smooth draw that shooters demand. In order to accommodate a wide range of uniforms and wardrobe styles, a double mounting system offers both paddle and belt threaded style attachment. To Remove the paddle all users need to do is remove the two head screws with an everyday allen wrench. Easy on and off use it on duty looks professional. I returned the product.. The paddle design cants the mags toward your body making it dig into your side. It also makes it difficult to get the mags out. The pouches were also tight even when adjusting the screw. An excellent choice for carrying spare magazines. The quick on & off of the paddle option, plus the magazine retention adjustability makes this a perfect choice (for me). Definately worth considering.